Troubleshot your electrical system & determined that your rectifier / regulator is not properly charging your system, our reliable, yet economical, high quality voltage regulator is great replacement item for you. 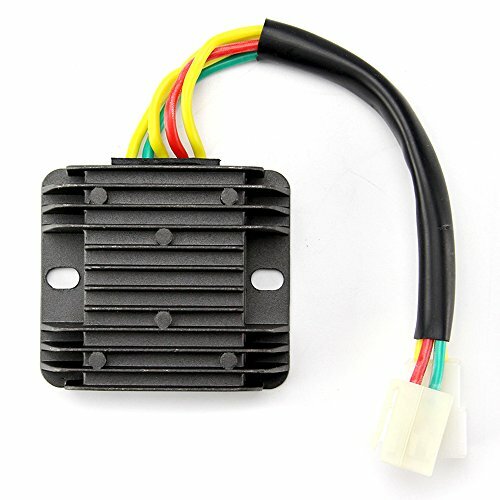 This Regulator Rectifier is manufactured to specifically fit the Year, Make, Models of the motorcycles listed in description, please make sure item fits your motorcycle well before ordering. This Voltage Regulator Rectifier is a direct replacement for your OEM Voltage Regulator Rectifier and has the same Plug Pattern connector. Therefore, no slicing is required. Due to wire length difference you may need to relocate regulator. Please check our measurements before you buy. Please kindly understand that the actual color may vary slightly from the online image due to monitor color settings. If you have any questions about this product by Oumurs, contact us by completing and submitting the form below. If you are looking for a specif part number, please include it with your message.